Vietnam’s Mekong Delta, home to nearly 20 million people, is one of the most highly productive agricultural environments in the world, thanks in part to an elaborate network of canals, dikes, sluice gates and drainage ditches. On the strength of Delta agriculture, Vietnam has gone from a chronic importer of rice to a major exporter. But farmers in the region are critical of the government’s food security policies, which mandate that most of the Delta’s land be devoted to rice production. And many of them are taking measures to circumvent those rules, in ways that aren’t always friendly to the environment. That’s just one example of how water and land-use policy in the Delta is undermining efforts to protect the vulnerable region from climate change and upstream development. This is the third article of an in-depth, four-part series exploring threats facing the Mekong Delta and how they might be addressed. Read the first, second and fourth installments. 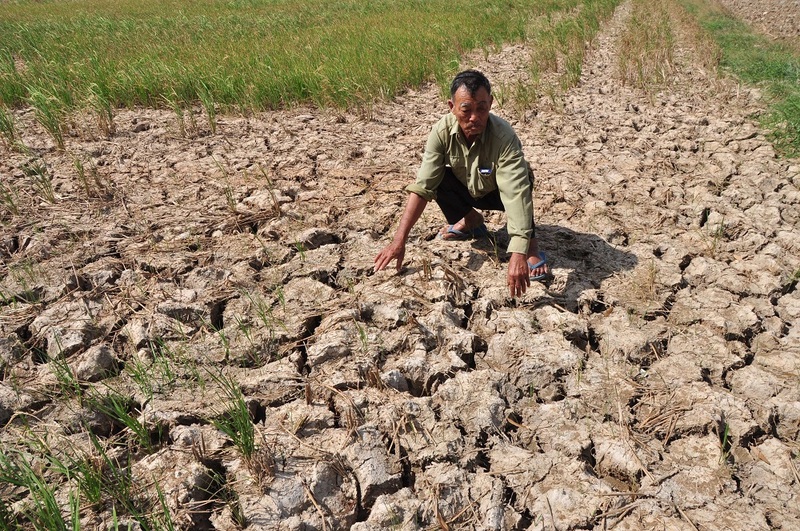 Early this year, many Mekong Delta farmers fought a losing battle against an epic drought, the worst since 1926. Was the drought a harbinger of climate change? Perhaps it was, but more certainly it was an artifact of El Niño. The same ocean-warming phenomenon that brought rains at last to my home in California deflected them away from Africa, India and Southeast Asia. The monsoon rains were light in 2015, and tapered off early. Nonetheless, as soon as they’d harvested the autumn crop, Delta rice farmers hurried to sow the winter-spring crop. 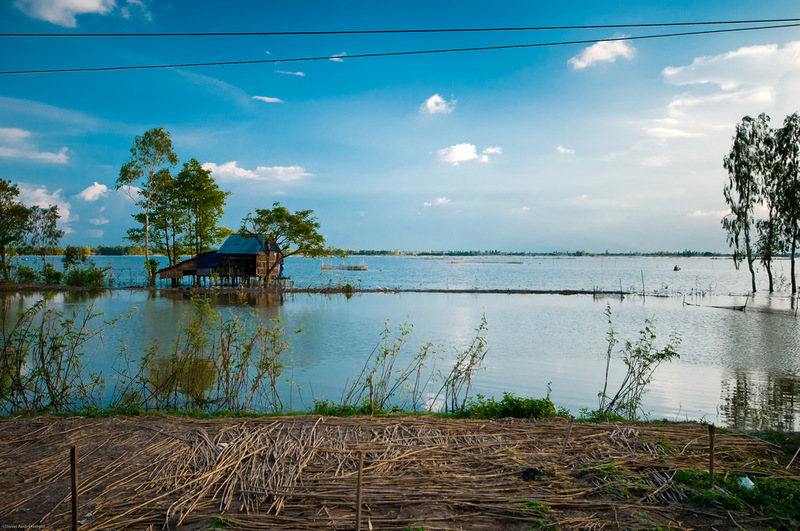 They didn’t reckon with an unprecedented surge of saltwater up the Mekong’s nine mouths. Normally, saltwater intrusion might be expected to reach 40 or 60 kilometers upstream. This year, however, it met only feeble opposition from the river’s current. In lethal concentration, four grams of salt per liter or more, brackish river water reached 50 percent further inland than usual, blighting rice fields in Soc Trang and Bac Lieu, wrecking fruit crops in Kien Hoa and Go Cong. When the Mekong reaches the Vietnamese border, 115 kilometers downstream of Cambodia’s capital, Phnom Penh, two channels braid and then divide again, en route to the South China Sea another 200 kilometers southeast, where nine mouths release most of the river’s waters. 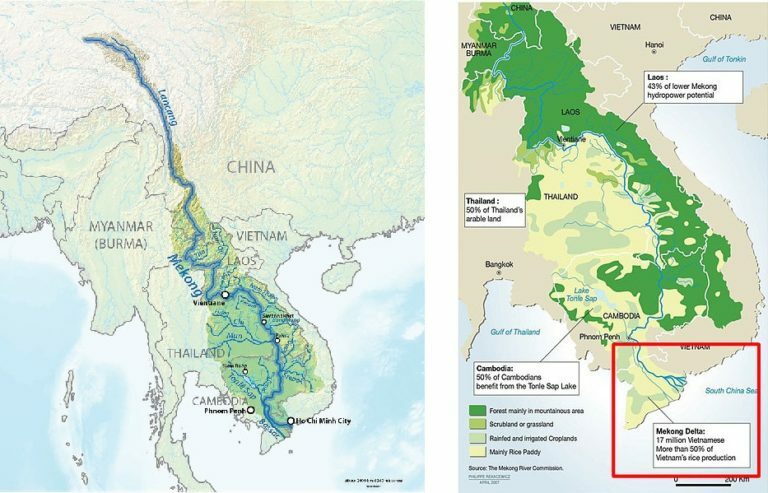 During the river’s annual flood, a substantial fraction of the Mekong’s waters also percolates across wetlands to the Gulf of Thailand 60 kilometers or more to the southwest. At the Vietnam-Cambodia border, the river is 3.5 meters above sea level. Except for a few granite hills, the land seems absolutely flat, a vast, soggy, intensively gardened plain. Seen from a temple atop one of the granite hills, 284-meter-tall Nui Sam, the border is clearly evident. Land on the Vietnamese side is densely cropped, laced by an elaborate network of canals, dikes, sluices and drainage ditches. To the west, upriver in Cambodia, the hydrological infrastructure is modest. It’s possible to imagine what the Vietnamese part of the Delta might have been like 30 or 50 years ago: a landscape enriched by annual inundations, well-suited to the cultivation of “floating rice” varieties that can grow fast enough to keep foliage and seed heads above the surface of the flood waters. Floating rice was the principal crop in the Delta floodplain until researchers in the Philippines developed short, stocky oryza cultivars that produced huge heads of grain if water levels were strictly controlled. The so-called “miracle rice” was introduced in parts of the Delta that were under the Saigon government’s control in the late 1960s. Adding ample inputs of fertilizer and pesticides, farmers produced harvests several times greater than if they grew the traditional crop, floating rice. After Saigon’s surrender in 1975, experts from northern Vietnam took the place of U.S. agricultural advisors. Under urgent instructions to expand food production, these officials mobilized Delta farmers to build extensive river dikes. By disciplining the annual floods, the dikes made it possible to harvest two or even three crops a year in former wetlands, the Dong Thap Muoi and An Giang Quadrangle aquifers. And, when market incentives and individual plots were reintroduced in 1986, that’s exactly what many Delta farmers did. The reforms triggered Vietnam’s evolution from chronic rice importer to the world’s No. 2 rice exporter. From 4.5 million tons in 1976, Delta paddy rice production reached nearly 25 million tons in 2013. Even after the market reforms enabled the nation’s farmers to produce huge rice surpluses, “food security” remained a top priority of Vietnam’s communist regime. As its citizens’ incomes rose in the 1990s, however, per capita consumption of rice fell. By 1997, Vietnam was the world’s second-largest rice exporter. In 2012 — ironically a year before Vietnam briefly nosed out Thailand as No. 1 — Hanoi decreed that to guarantee sufficient land for growing rice for the foreseeable future, some 3.8 million hectares, 58 percent of the nation’s arable land, would be restricted to rice production. Of that area, 3.2 million hectares were designated for double cropping. What this means is that about half of the Delta’s farmers have been locked into rice cultivation, though the profit they could earn farming vegetables, fruit, fish or shrimp is far greater. In principle, they are assured a modest profit on every kilogram of paddy, but the state-owned Vietnam Southern Food Corporation makes sure that the price never rises above a level that will cause it trouble exporting bulk rice. The International Union for the Conservation of Nature (IUCN) is skeptical of the government’s lingering obsession with food security. Jake Brunner is the organization’s Mekong projects coordinator. The higher dikes that enable three crops of rice a year prevent flood waters from depositing sediment on Delta fields, he explained, and so farmers must apply fertilizer heavily. 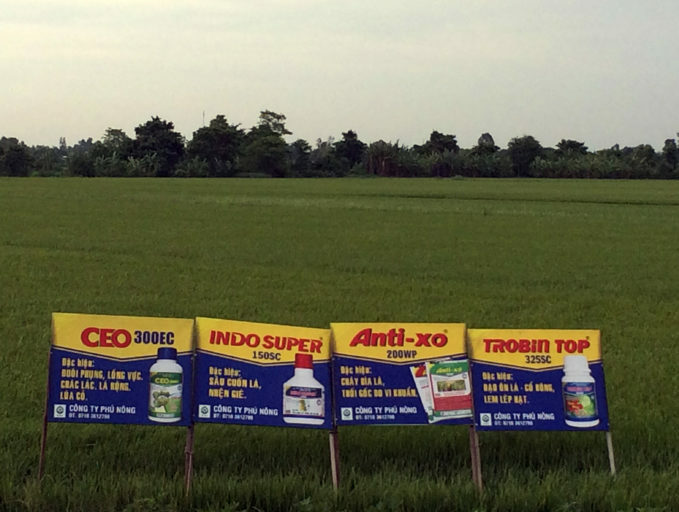 Liberal use of pesticides and herbicides is also needed to maximize the yield from new fast-growing rice varieties. When the engineering and environmental costs of rice intensification in the Delta are factored in, the IUCN calculates, it’s the companies that build and maintain the infrastructure and the state-owned companies that export high volumes of rice that make a nice profit. The region’s farmers just get by. Chau Thi Da heads the Aquaculture Department at An Giang University. He told me that wild fish stocks have crashed since 1995, when farmers began to raise local catfish for export. At first, other river fish were harvested to feed the catfish, explained Da, but within a few years, these were scarce. Still, business has been good. Exports of river fish from the Delta now earn Vietnam $2 billion annually. The fish farmers buy bycatch from marine fisheries for feed and are experimenting with soybean meal pellets from the U.S. So, said Da, even before dam construction began upstream in Laos, parts of the lower Mekong had been scoured clean of once abundant “whitefish” stocks. Nor are they likely to rebound, he explained. The dam construction at Xayaburi in Laos prevents 64 of the 100 migratory species of fish in the Mekong from reaching their spawning grounds. The Delta’s catfish fishery now relies on artificial breeding. At Can Tho University’s DRAGON (Delta Research and Global Observation Network) Institute, saline intrusion is seen as a gamechanger for Mekong Delta agriculture. The 1-meter sea level rise that’s foreseen between now and 2100 would put 38 percent of the Delta at or below sea level, said institute director Le Cong Tri. Although Vietnam’s agriculture ministry has proposed to extend and reinforce existing sea dikes, most analysts believe that rising seas will eventually force a retreat to higher ground. That’s a central assumption of the draft Mekong Delta Plan now under study by the Vietnamese government. During the past 30 years, the mean sea level has risen off southern Vietnam by nearly six centimeters; meanwhile, the amount of silt the river brings annually has fallen sharply, from 160 million tons in 1992 to only 75 million tons in 2014. Less rain is falling on the Delta, too, report the Can Tho University scientists. Extrapolating a trend first noticed in the 1980s, they foresee reduction in annual rainfall by the 2030s on the order of 20 percent. 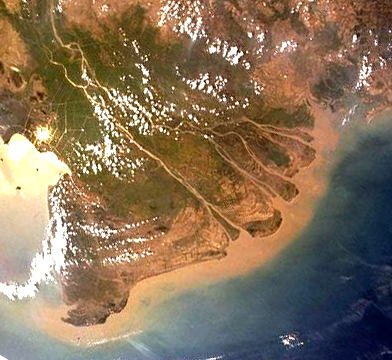 A NASA satellite image of the Mekong Delta. That’s not all. Where salt intrusion is greatest, deep wells are being drilled into ancient aquifers to secure fresh water. 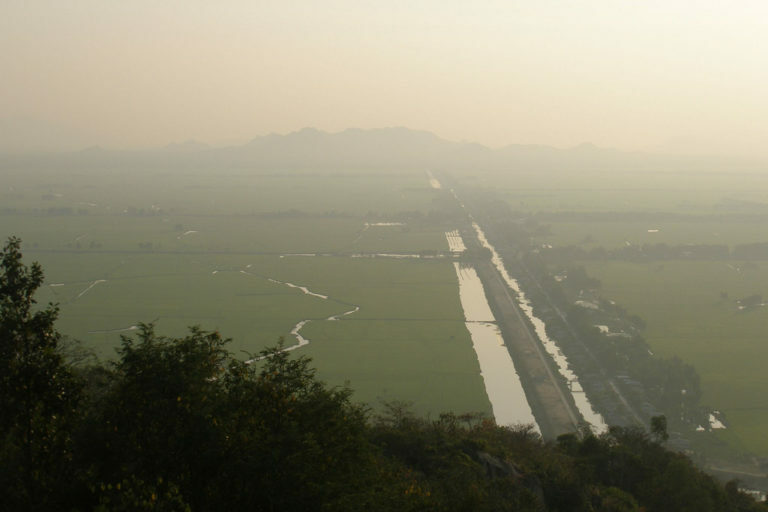 The high dikes that enable two or three rice harvests annually prevent the aquifers’ recharging. So, particularly in Ca Mau, Vietnam’s southernmost province, land is slowly subsiding, approximately 2 millimeters annually. It is becoming inexorably easier for salty water to infiltrate rivers, creeks and canals at high tide and spill over dikes and berms into rice fields and orchards. Since 1975, sluice gates have been the preferred defense against tidal intrusion; they are closed during the dry season, when river waters are low, and opened when the annual floods raise river levels. This engineered solution to keeping out salt is controversial. As the monsoon rains began in earnest this year, I drove through an area south of Can Tho with my friend Hai, who taught at An Giang University before joining the agriculture ministry. He is skeptical of the barriers’ worth. We stopped at several canals that had been blocked to keep out seawater. All were stagnant and foul. The invasive water hyacinth was crowding out lotus, a cash crop. In Ben Tre province, Dr. Hai told me, the giant Ba Lai sluice gate blocks one of the Mekong’s smaller estuaries. It was put into service in 2004 to “sweeten” the river upstream. The barrier is generally regarded as a poor investment because it has proven impossible to flush out pollution for most of the year. In the dry season, the river water above the Ba Lai gate is now too salty to irrigate vegetables or fruit. The agriculture ministry’s dikes department, however, has a solution: more sluice gates. The problem at Ba Lai, it argues, is upstream of the barrier: salty water infiltration from other branches of the Mekong that are as yet ungated. Near the coasts of the South China Sea to the east and the Gulf of Thailand to the west, in many villages the groundwater is now naturally brackish. There — as at Ba Lai — tens of thousands of farmers have concluded that rice farming no longer provides a viable living, but shrimp aquaculture does. They are in a bind, however, if the land the state has allotted to them is designated as rice land, and it is forbidden to grow other crops. Unless, of course, local officials are willing to look the other way while farmers open the sluice gates, anticipating a policy change that’s been long in coming. Shrimp farming has been big business for years in parts of Ca Mau, Bac Lieu, Kien Giang and other coastal provinces. 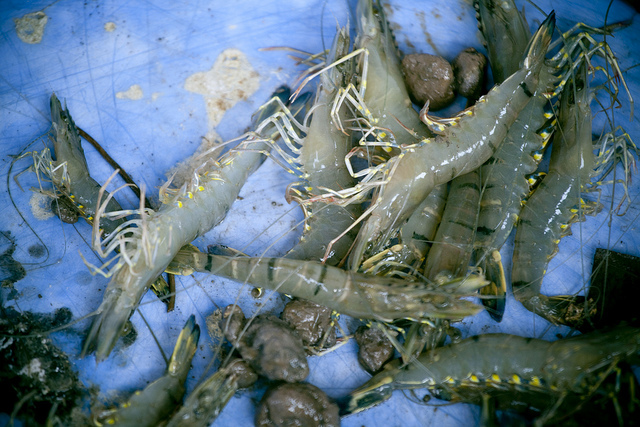 In 2013-15, Vietnam exported $2.7 billion dollars’ worth of tiger prawn (Penaeus monodon) and Pacific white shrimp (Litopenaeus vannamei) annually. Some 580,000 hectares of coastal land have been ponded for shrimp culture. In places where there’s enough rainfall to flush out salt, shrimp is the dry season crop, and rice is grown during the wet months. More than rice farming, brackish water aquaculture is a tricky business; it requires careful management of water quality, salinity, soil chemicals and other inputs. And, while the state guarantees farmers a small but reliable profit on rice crops, shrimp farmers are at the mercy of market conditions. When Vietnam’s long war ended in 1975, the central planners of the victorious Hanoi regime gave high priority to boosting food production in the Mekong Delta. After initial reverses, they succeeded remarkably. Rapid increases in the production of fish, shrimp, fruit and especially rice fueled an export boom that prefigured and supported the broader development of the nation’s economy. Vietnam’s drive to produce ever more from the Delta has hit a wall. Policies implemented over the past 40 years have taxed the fertility of the Delta’s soil and severely compromised its ecosystems. Sea level rise, changing rainfall patterns and human interventions upstream are inflicting additional stresses on the farm economy. In far-off Hanoi earlier this year, the regime reaffirmed Vietnam’s hoary food security policy in principle (3.76 million hectares nationwide will continue to be reserved as “rice land”) but retreated from it in practice (of this total, some 400,000 hectares of paddy that’s subject to saline invasion can be planted in other crops so long as “conditions required for rice farming are conserved.”). In plain words, the government will allow farmers to grow more profitable crops on land that’s become marginal for rice production. To my Delta interlocutors in June, mostly academics and a few “model farmers,” Hanoi’s decision was welcome. It signaled that Vietnam’s leaders understand that adaptation to changing circumstances has become urgent. But, when so many remain deeply invested in the status quo, is bold action possible? Read the series’ final installment here.